Hidalgo Mining International (HMIT) Announces LOI Signed to Acquire Fifa Mining Inc.
NEW YORK, NY--(Marketwire - May 13, 2008) - Hidalgo Mining International (PINKSHEETS: HMIT), an innovative mining company headquartered in Port Washington, NY, announced today that it has signed an LOI to acquire Fifa Mining Inc. Fifa holds key assets, including the mining rights to the Fifa project in Guinea, West Africa within the Siguiri Basin. Mark Daniel Klok, President of HMIT, stated: "The Company has entered an agreement with Fifa Mining Inc. to begin producing on the Fifa land prospecting permit. 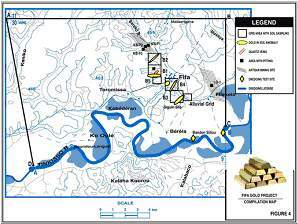 The permit, located in the northwest corner of the Siguiri Basin, is approximately 88 kilometers west of the town of Siguiri and approximately 65 kilometers west of the Siguiri Gold Mine Operation that is currently owned and operated by AngloGold Ashanti. This agreement consists of a 60-day due diligence period, during which Hidalgo shall commence production on the property. We are very familiar with this property and the associated permit and therefore anticipate confirmation of feasibility, through actual production, well within the 60-day period. Consummation of this acquisition would be an enormous step towards our goal of becoming a world-class junior mining company." The Fifa permit area is underlain by finely stratified siltites, argillites, and minor feldspathic sandstones, typical of continental marine platform deposits. Most of the Siguiri Basin is almost entirely covered with laterite duricrust plateaus, pediments, and recent alluvial deposits. Outcrops are rare and mostly saprolitic in nature. Immediately south of the Fifa permit area the pelitic sequences are cut by lenses and larger bodies of monzogranite and granodiorite and are of the type recognized throughout the Siguiri Basin. Altered and weathered cobbles of a fine to medium grain rock of basic composition (diabase) have also been observed in the area. The ductile deformation affecting the sedimentary sequences is along a general north-northeast axis. The linear pattern of some of the streams draining towards the Tinkisso River in and around the area suggests that north-northeast to north-south and east-northeast to north-northeast structures have affected the rocks. The various orientations of quartz veins and some of the ridges observed on the projects and elsewhere are concordant with these orientations. Evidence of hydrothermal activity is obvious on the projects where extensive quartz veining and kaolinite alteration is pervasive. 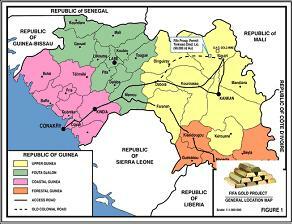 The free gold recovered from the alluvial deposits on the permit area finds its source in the country rocks. Reconnaissance prospecting and soil sampling around the village of Fifa have highlighted the potential of the permit, for both lateritic type and primary gold deposits. Several quartz veins related to hydrothermal activities, often associated with gold mineralization, have been found on the permit. Pits and a trench have been excavated to properly sample one of the veins located south of the village of Fifa. The trench revealed that the vein is part of an extensive hydrothermal veining system similar to the one hosting some of the gold deposits at the nearby Siguiri gold mine. Sampling in this trench returned anomalous gold concentration in the altered wall rocks. The highest value obtained was 13.4 grams of gold per ton over a 60-centimeter section of the trench. Between June 2002 and July 2007 HMM maintained a prospecting crew in the Fifa land prospecting permit area with the objective of testing the land potential for economic gold deposits in the alluvial deposits and laterite formations. The fieldwork program, consisting of pitting, soil sampling, and trenching, was carried out mainly west and south of the village of Fifa in the eastern section of the permit area. During this time HMM outlined four blocks where previous local mining activity had taken place within the Fifa land prospecting permit area: Kolen-Jima, Kele-Lolou, Siguiri-Sila and Kabine-Bee. HMM estimated that the four areas have a first resource estimate of 488 kilograms (approximately 15,700 ounces) of recoverable gold. A first conservative estimate based on the data available to date and assuming that 50% of the original ore remains on site, inferred that a resource of 1,000 kilograms (approximately 32,000 ounces) of gold could be recovered from the four blocks. A preliminary prospecting program for alluvial gold deposits was carried out on these four blocks. A total of 28 prospecting pits in the alluvial deposits of the Bereko River were excavated. The Kabine-Bee block, located 4.1 kilometers north of Fifa where the alluvial flat of the Bereko River narrows, has been extensively exploited by past artisan operations for at least 500 meters along the course of the river. Along one line, three prospecting pits were excavated at 100-meter spacings. The basal gravel composed of sub-rounded quartz cobbles with minor amounts of pisolitic pebbles in a brownish sandy quartz matrix was reached at depths ranging from 5.6 meters to 9.44 meters under an upward sequence of sand, silt and clay overburden. The thickness of the gravel ranged between 0.27 and 1.16 meters and the calculated grades ranged between 0.2 to 1.97 grams per cubic meter. At the Kele-Lolou block, located east of Fifa, a single pit was excavated on the edge of a large alluvial mining field. The gravel was 1.90 meters thick, but the recovered grade was 0.4 grams per cubic meter. At the Siguiri-Sila block, approximately 2.0 kilometers south of Fifa, 14 pits on four lines were completed over an area of about 300 cubic meters that was untouched by the local miners. The average depth to saprolitic bedrock over the area ranged between 5.0 to 9.0 meters with a basal gravel ranging in thickness between 0.5 to 2.0 meters and had a recovered grade range between trace to 7.37 grams per cubic meter with an average grade of 2.18 grams per cubic meter. These results are considered significant and of economic interest, but additional prospecting will be necessary to outline larger volumes of gravel with similar grades to justify an eventual mechanized operation. During the prospecting program, several areas with outcropping quartz veins were identified in the eastern portion of the Fifa land prospecting permit area. The veins often formed positive relief and outcrop along the flanks of ridges and hills above the edge of the pediment deposits. The thickness of the veins ranges from 40 centimeters to approximately 1.0 meter. Five of these veins were sampled. Results showed gold content varying from less than 10 parts per billion gold to 250 parts per billion gold. Two samples revealed concentrations of 1.3 grams of gold per ton over 0.5 meters and 9.5 grams of gold per ton over 0.7 meters. HMM also carried out prospecting for gold in eluvial deposits. During the course of HMM's program approximately 500 soil samples were collected at 100 meter spacings from the eluvial deposits and adjoining saprolitic zones over an area covering approximately 19.25 square kilometers and extending along the west bank of the Bereko River and south of Fifa. In the southeast corner of the grid, following the emergence of a significant anomalous area (up to 1,249 parts per billion gold) the sampling grid was reduced to 50 meters around the anomalous sample area. The overall average gold concentration for the entire sample population available was 5.0 parts per billion gold including samples with gold concentration below detection limits of the analytical method of 10 parts per billion gold. Excluding these samples, the average concentration was 139 parts per billion gold with 78% of the samples with concentrations between 10 and 130 parts per billion gold. Gold in soil anomalies were found in each of the sampling grids and were forming relatively scattered but persistent northeast to north-northeast trending zones. These anomalous zones are continuous for several meters along strike. Hidalgo Mining International (PINKSHEETS: HMIT), an innovative mining company headquartered in Port Washington, NY, strives to increase shareholder value, while implementing aggressive plans to continue targeting near term mining production projects on a global scale. HMIT's management, directors, and advisors hold an abundance of experience and knowledge to implement expansion in this rapidly growing industry. The results described herein cannot be guaranteed. The development of any and all of the subject mining claims stated herein are contingent upon multiple high risk factors that must be successfully dealt with in order to achieve the intended results. This release contains "forward-looking statements" within the meaning of Section 27A of the Securities Act of 1933, as amended, and Section 21E the Securities Exchange Act of 1934, as amended and such forward-looking statements are made pursuant to the safe harbor provisions of the Private Securities Litigation Reform Act of 1995. Statements in this news release other than statements of historical fact are "forward-looking statements" that are based on current expectations and assumptions. These expectations and assumptions are subject to risks and uncertainty, which could affect Hidalgo Mining Internationals' future. Forward-looking statements involve risks and uncertainties that could cause actual results to differ materially from those expressed or implied by the statements, including, but not limited to, the following: the ability of Hidalgo Mining International to provide for its obligations, to provide working capital needs from operating revenues, to obtain additional financing needed for any future acquisitions, to meet competitive challenges and technological changes, and other risks. Hidalgo Mining International undertakes no duty to update any forward-looking statement(s) and/or to conform the statement(s) to actual results or changes in Hidalgo Mining International's expectations.